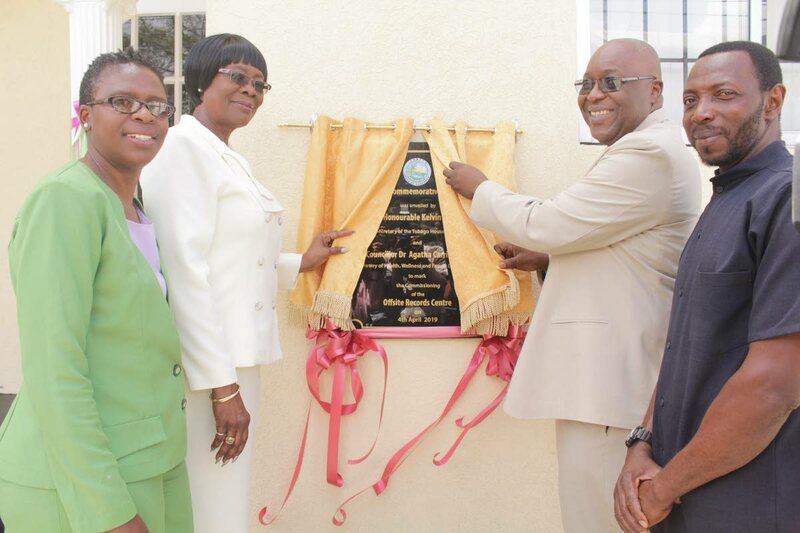 DATA CENTRE: Dianne Baker-Henry, left, administrator in the Division of Health, Wellness and Family Development; Health Secretary Dr Agatha Carrington, second from left; Chief Secretary Kelvin Charles, second from right, and Pastor Ellis Clarke, right, at the commissioning of an Off-Site Records Centre at Salandy Building, Piggott Street, Uptown Scarborough, recently. TOBAGO'S elderly and other vulnerable groups can expect better healthcare and a wider array of services, after the signing of a Memorandum of Understanding (MOU) between the Division of Health, Wellness and Family Development and the Trinbago Progressive Association of the USA. Health Secretary Dr Agatha Carrington said the division is ready to vigorously partner with the association to assist and protect the elderly. "We have to improve the plans we have for them. We must collaborate in service provision for this group at the homes, activities centres and their lives,” she said. The division also has plans to collaborate with the Tobago Association of the Elderly to discuss the management of the division’s activities centre. Carrington said the signing of this MOU holds a commitment made last year at the Trinbago Progressive Association's 24th annual award in New York, where she promised to assist in the area of primary care and focus on the elderly and children. The MOU includes the provision of community outreach services, clinical services, medication management and research. The Trinbago Progressive Association of the USA (formally, the Tobago Progressive Association of the USA) was founded by the late Dr George Oliver Phillips and is incorporated in the State of New York as a not-for-profit non-governmental organisation. Over the years, the association has conducted free health fairs and other health-related activities throughout Tobago. The volunteers, which include medical professionals and other sponsors, are on ten medical missions throughout TT. She said it is important to urgently treat with health and social problems affecting Tobago. Stephen Isaac, president of Trinbago Progressive Association, said the signing of the MOU is a continuation of an existing relationship with the THA. “We have had this journey that has been going on and it feels like it has been going on forever. This is now a start of another phase and we should let service to others be our highest calling,” he said. Representatives of several Tobago NGOs were also present to witness the signing. Reply to "Focus on improved elderly care"